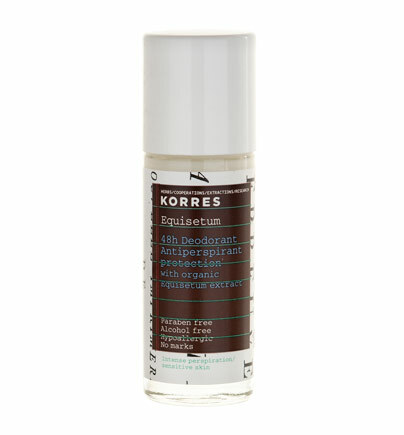 Korres Deodorant for Intense Perspiration with Organic Equisetum Extract , 30ml . 48h deodorant antiperspirant protection with organic Equisetum extract, that respects skin balance. 48 hour deodorant protection for intense perspiration. With natural deodorant actives and Equisetum extract that offer effective protection against sweat and body odor. The active ingredient bisabolol, prevents skin irritation and leaves skin hydrated and soft.